UCLA Football: Jim Mora Stat. Honestly, great game and a nice coda to what was truly the strongest season of UCLA football I’ve seen. Better than McNown/Toledo, better than the Olson, the other Olson, Paus, Cowan or other ‘eras.’ Suffice it to say it hasn’t been the greatest run since ’98 but there were some moments. Thing is, this is no ‘moment.’ Mora really did stamp this program and elevate it back to where it was at least during my time as a student. The enthusiasm, toughness, connectivity with his players – it’s all very endearing and inspirational, and the players love to play for him. More importantly, they’re awesome. AND fun to watch. I saying yesterday that whether the Bruins are on offense or defense, I don’t want to get up to leave because there is so much excitement with that vast talent base. Speed, strength, attitude – are these really the Gutty Little Bruins? No, they’re not. And if Hundley comes back we’re literally a top five team next year with two(!) Heisman contenders. Last night, the sparsely populated/outdated Pauley Pavilion denizens were able to see the new Ben Howland, and a precursor to the throwback showtime original brand of Bruin basketball that promises to be on display throughout the 2010-11 season. In a dominating 83-50 defeat of the defenseless Cal State Northridge Matadors, Howland’s Bruins pummeled the opposition with stifling, swarming, suffocating defense and – surprise! – a high-flying, potent offense. Granted, this is ‘just’ CSUN, but the fact is in years past the Bruins haven’t exploded offensively much anywhere, against anybody. Scores of 53-49, 55-50 and 59-41 are generally the hallmark of the solid Bruin teams. . .which is generally nothing to complain about – unless you happen to be a college hoops mecca located minutes from Hollywood and a freeway jaunt from Showtime. The calls for Ben Howland’s firing were a bit egregious, but a tumultuous and underperforming season had Bruin fans clamoring for Steve Lavin. . .okay, that’s not quite the truth, but the Bruins 14-win season, coupled with transfers & dismissals of previously touted recruits (Morgan, Gooden) did not bode well for this year, as the Bruins were ranked only third in conference in the preseason coaches poll. Bottom line? Howland had to ratchet up the tempo, not only to win ballgames. . .but to get back to winning recruits. One of THREE Bruin Tylers, Tyler Lamb and the monstrous frosh center Josh Smith – along with Laser-fast Juco transfer Lazeric Jones – formed one-third of Howland’s rotation and shot a combined 11-for-20 last night versus the Matadors, and all three displayed the attacking, almost-frenetic pace that may become commonplace for this year’s squad. Malcolm Lee – clearly MUCH more comfortable as a shooting guard, was able to slash & drive his way to eight early points. Confidence is up, and should regain the All-American form that he was unable to feature during the Howland clampdown. Tyler Honeycutt – reminds me of a more spindly Cedric Ceballos; not really a focus of designed plays but always finds the ball. . .and points. He’s barely carries 183 pounds on his 6’8″ frame, but can already shoot, pass & score like an All-Conference player. Reeves Nelson – somewhere between Lorenzo Mata and Kevin Love – initially looked like it was heart, toughness & grit would be his hallmarks but a deft shooting touch and knack for scoring put this big man on the Pac-10 radar. Brendan Lane – still a bit tentative in recovery from last year’s ankle injury, but he has a nice touch and is a good body down low; should further complement the stacked frontcourt for 2011-12 when the Wear twins gain eligibility. Anthony Stover – very surprising toughness and touch. Going to be a very key player in Howland’s rotation, and a good addition to the frontcourt. About the only negative from the ballgame was the further lack of progress from nice guy Jerime Anderson, who tallied one point less than Blake Arnet in a very forgettable 16 minutes of work. Anderson is in his third year and plans to be Howland’s ‘sixth man,’ but he needs to improve and regain the confidence he had coming out of high school. The frontcourt is going to be a bit thin and a work in progress; though Jones & Lee form what is already a top NCAA duo, Lamb is still a freshman and Anderson needs to fill his role for the Bruins to really achieve this year. That said, last night’s game augurs well for a huge season – the final score could easily have been about 96-35, and that’s how elite teams are supposed to stomp directional – or in this case, commuter – schools. Keep an eye on these Bruins, baby – Sweet 16 this year, championship caliber in 2011-2012. Be ready for a better than expected UCLA Bruin hoops season in 2010-2011, Bruin fans. Though the coaches pick the Bruins for third in an underrated Pac-10 conference, the returning frontcourt of Tyler Honeycutt (Sylmar) and Reeves Nelson (love thug) teaming with massive frosh Josh Smith (300+ lbs) will provide a good foundation for Malcolm Lee‘s return to his natural SG role. With the point guard duo of underrated Juco transfer Lazeric Jones & the returning Jerime Anderson finally forcing Ben Howland to pick up the pace, YKI thinks that the Bruins stand a good shot for unexpected dominance this year. Also note the Bruins have a freshman forward named Alex Schrempf. Name sound familiar? It should – son of Detlef, one of the most awesome Euros ever in the NBA. One more in the proud UCLA lineage as well; a freshman walk-on by the name of Jack Haley will fight Wooden’s grandson Tyler Trapani for the hearts of hustle-loving fans. And yes, Haley is the son of that Jack Haley. Anyway, the fun ride starts tonight vs. the mighty Matadors of Cal-St. Northridge. My wife and Dad both attended CSUN, so I will be in attendance and rooting for upstart, Bobby Braswell-led Valleyboys to. . .put up a fight in the first half and earn some experience to lead to a return to the Tourney. Courtesy of Sporting News (print) and Yahoo! Sports Online, Five Guys About to Make It Big in the NBA for the 2010-2011 season – note the top three – each of themUCLA Bruins. 1. Jrue Holiday(notes), PG, 76ers. He is long and talented and has really only scratched his potential. But the more he played last season, the better he got. The question has always been: How well can he run a team? And if you are going to have him as your one, you want to have a two who can be a playmaker, too. That’s what they have with Evan Turner(notes). 2. Darren Collison(notes), PG, Pacers. When you look at the numbers he put up as a starter when Chris Paul(notes) was hurt, obviously, if he gets big minutes he is going to produce. The one thing that worries me, though, is whether he’ll fit Jim O’Brien’s system. It’s not a traditional offense where the point guard simply creates and racks up assists. That’s what he did in New Orleans, and O’Brien will have to adjust a bit. 3. 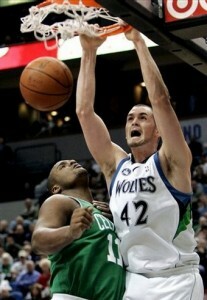 Kevin Love(notes), PF, Timberwolves. He has gotten better as a rebounder, and he is one of the more versatile power forwards out there. He can shoot it from medium and long range, and he is a tough matchup. He has to get better defensively—if he had been healthy all of last year, he would have made some natural improvements. 4. D.J. Augustin(notes), PG, Bobcats. Someone has to be the point guard. He took some steps backward last year, but that was because Larry Brown really wanted to make Ray Felton into a pretty good point guard. And he did. Now, with Felton gone, he can do the same with Augustin. He can shoot the 3, but he has to do better at playing within Larry’s system and not trying to do too much on his own. 5. J.J. Hickson(notes), PF, Cavaliers. There is a reason everybody wanted this guy at the trading deadline, but the Cavs will be happy they kept him. He is a beast inside and a great athlete. He could eventually block 2.5 to three shots per game. He will be a good rebounder, and although he might not have the smoothest offensive game, he runs the floor very well—and they’re going to be a good transition team.